How do you place isolines on the top surface of a model? As I mentioned, if you are using the standard kriging modules, this is fairly straightforward. Just add a geologic_surface module to your network, and connect it to isolines. 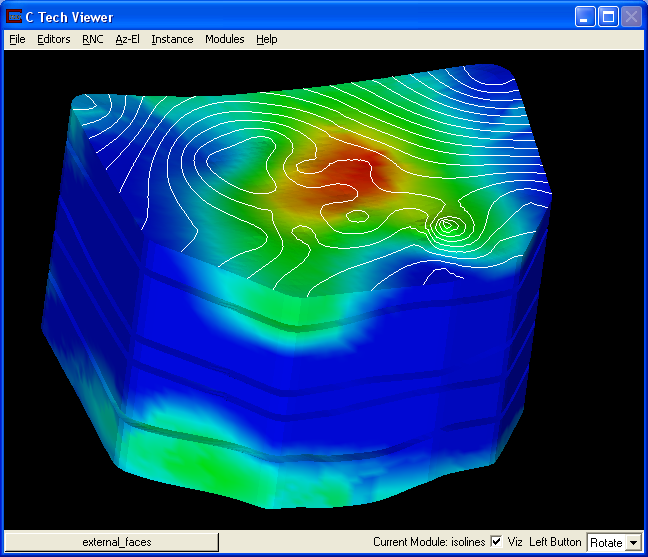 The geologic_surface module provides elevation data directly for isolines, and allows you to pick any of the surfaces of the model. There’s no Krig_3D_Geology anymore, which means we have no surface to connect to isolines! 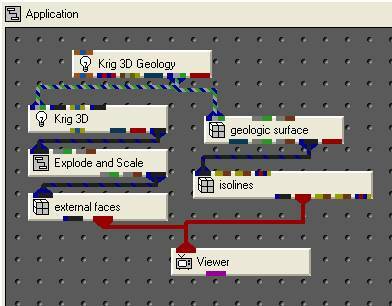 If we still had the original geology file, we could add a Krig_3D_Geology to our network, and set it up to run the way we did before, but that would be a lot of extra information, and also adds an element of risk – it may be difficult (if not impossible) to exactly match the information that was used when creating the EFB file. To make matters worse, this EFB file may have come from some other source – like the results of a groundwater model package. In that case, we may have never had a geology file that we can use. Fortunately, there is a way to get there – the slope_aspect_splitter module. This module was added in Version 8.5, and has many uses. In this case, it will let us take a 3D model and split off just the top surface of the model. First, we’ll need to get a second Explode_and_Scale module. We’ll connect the green-gray and gray-brown ports from the main Explode_and_Scale module to our second, but in Explode_and_Scale#1, we’ll turn off all of the layers except the first. 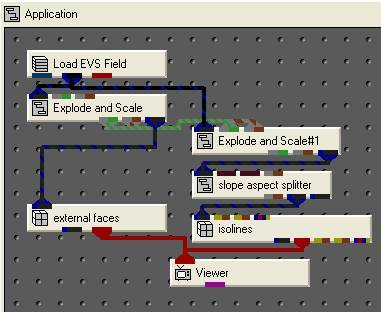 This Explode_and_Scale will now output a copy of just the first layer of our model. Without this, we would get isolines on the tops of each layer – not just on our top surface of the model. This module works by taking all of the external surfaces of a model, and splitting them into two separate outputs for us based on the slope or aspect of individual triangles in the model. By default, any surfaces with a slope of less than 89.9 (everything facing upwards) are output in the first blue-black port, and any surfaces with a slope greater than 90 degrees (facing sideways or down) are output to the second blue-black port. The slope_aspect_splitter module lets us use the standard math routines in EVS to customize this, so we could do things like texture just the north facing walls of a building with texture_walls, or put a texture_map on just the upper surface of a model, or anything else that can be determined by slope or aspect. 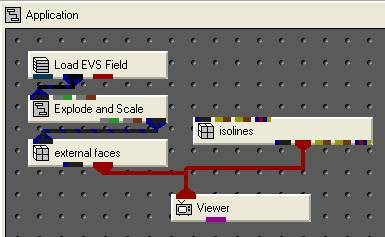 In this case, it allowed us to separate out just the top surface of our model, and use it for isolines, without having the original input data.